This card fulfills the requirements for entries at Susie and Vikki's Christmas Card Challenge 9 - Christmas Baubles, the ABC Christmas Card Challenge - G is for Glitz with optional extra silver, The Pink Elephant sketch challenge 59. The ribbon is silver, I dragged the main image in silver ink and added EP for extra sparkle as well as the ornaments in the background are stamped and embossed with silver. Cuuute Kitty and loving the baubles! A whole lotta Christmas going on here! Wow Kelly this is beautiful I love that image and the embellishments you have done a wonderful job here. 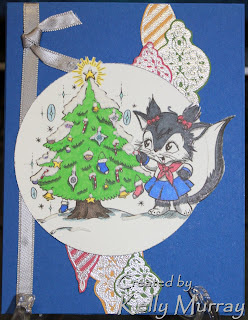 Super card Kelly, those baubles are gorgeous and work very well with the sketch too. Thankyou for joining in Susie & Vikki's Christmas club challenge this week. fabulous card! thanks for joining in with us on the ABC Christmas blog. Super cute Kelly! 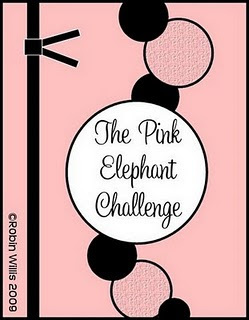 Thanks for joining us this week with our sketch challenge at TPE! Super cute card! I love that little image!! Thank you so much for playing along with the ABC Christmas Challenge. We have another fun one that started today: H for Holly with a bonus sketch. Hope you can play along again!